Showing 1 - 20 of 361 results. 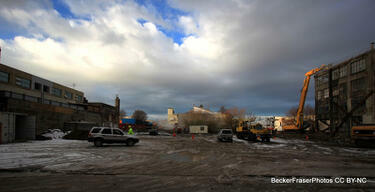 Photograph captioned by BeckerFraserPhotos, "Looking west along Hereford Street from the Manchester Street corner". 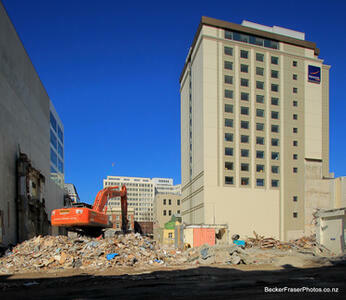 Photograph captioned by BeckerFraserPhotos, "Novotel Hotel, Gloucester Street". 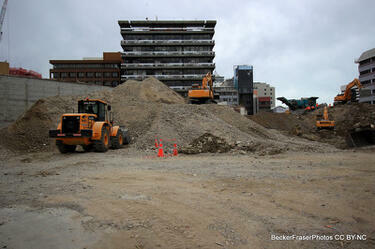 Photograph captioned by BeckerFraserPhotos, "Remaining crushed concrete rubble on the site of the Hotel Grand Chancellor, Cashel Street. 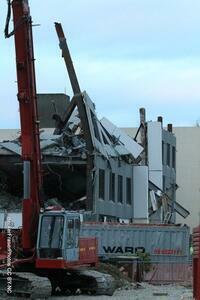 Te Waipounamu in the background (to be demolished)". 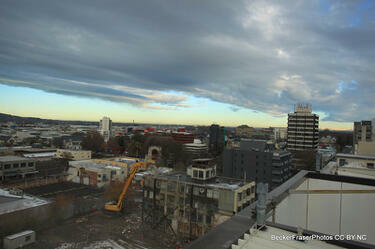 Photograph captioned by BeckerFraserPhotos, "A view of the city looking south-west from the roof of the Ibis Hotel. 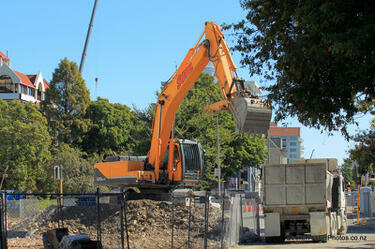 Gough House in Hereford Street is being demolished, with the Bridge of Remembrance behind". 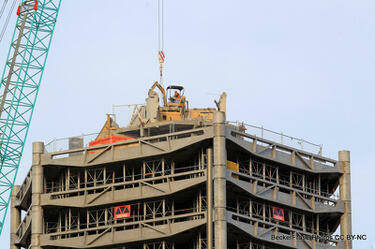 Photograph captioned by BeckerFraserPhotos, "Westpac Bank, High Street. 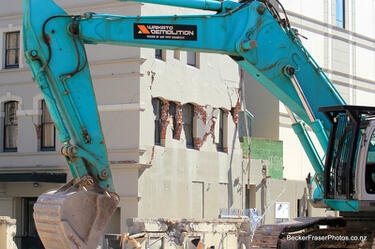 A 3 tone digger demolishes part of the building core". A photograph captioned by BeckerFraserPhotos, "The Hotel Grand Chancellor, viewed from Hereford Street". 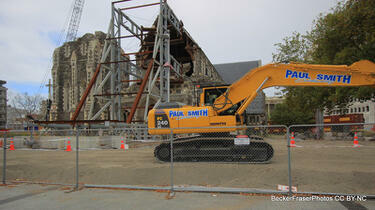 Photograph captioned by BeckerFraserPhotos, "A layer of protective material has been laid in front of the ChristChurch Cathedral and a digger is sitting on it". 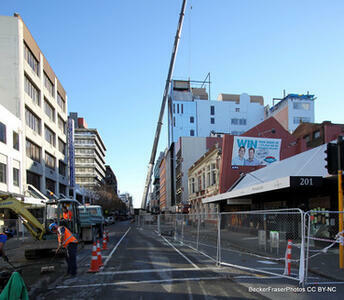 Photograph captioned by BeckerFraserPhotos, "The digger is working on the remains of Gough House, with the fragile remains of the wooden heritage building Shands Emporium (one of Christchurch's oldest retail buildings) still standing on Hereford Street". 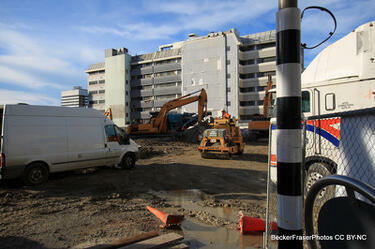 Photograph captioned by BeckerFraserPhotos, "Looking across the demolition site of Brannigans towards Cathedral Square". 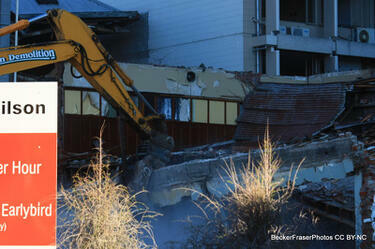 Photograph captioned by BeckerFraserPhotos, "Demolition site of Brannigans". 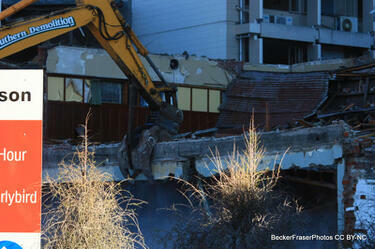 Photograph captioned by BeckerFraserPhotos, "Theosophy House on Cambridge Terrace being prepared for demolition". 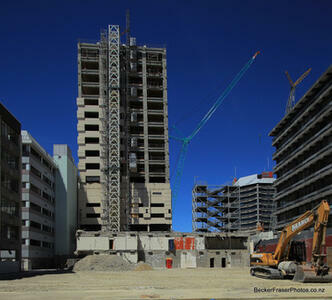 Photograph captioned by BeckerFraserPhotos, "Wider view of 92-108 Hereford Street". 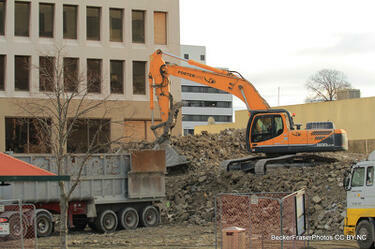 Photograph captioned by BeckerFraserPhotos, "Rubble in Cathedral Square being stockpiled to provide a high base platform for the giant nibbler to demolish the Grant Thornton building (upper left)". 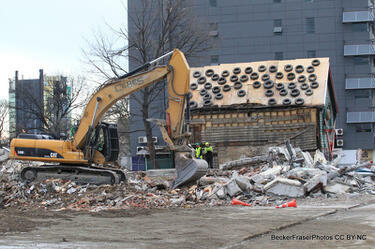 Photograph captioned by BeckerFraserPhotos, "The demolition site of 151 Kilmore Street". 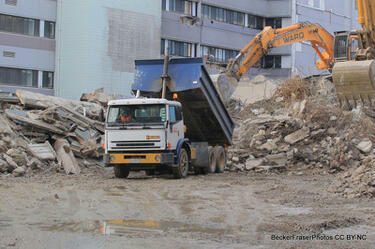 Photograph captioned by BeckerFraserPhotos, "164-170 Hereford Street is used as a concrete recycling and crushing area". 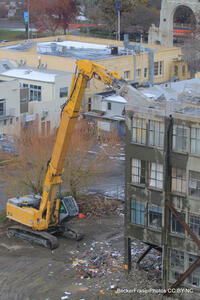 Photograph captioned by BeckerFraserPhotos, "Big nibbler begins to work at the rear of Gough House, Hereford Street". Photograph captioned by BeckerFraserPhotos, "The side view of the All Seasons Hotel which used to be obscured by the Hotel Grand Chancellor".